The Historian’s office is open Wednesday evening from 6:00 PM – 9:00 PM or by appointment. There are many historical documents, photos and books available for your study and enjoyment. Looking for that unique gift? The village has two books for sale, both by former Historian Leith Wright, Hilton USA, and First Families are available by stopping in at the Village or Historian's office. They are $10 and $20 each, respectively. 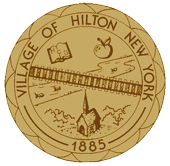 Do you have anything old pertaining to the Village of Hilton? Historian David Crumb reports each year on certain unique articles, newspaper clippings, letters, etc. that are of local interest. For example, Following the death of long time Village resident Lucille Burritt Pfarrer, daughters Mary Tilebein, Anne Hall and Donna Pfarrer donated many valuable old Hilton photographs, diaries and newspaper accounts relating to the Skinner, Smith, Pfarrer and Burritt families. The banner used on the bus for the “Hilton Peaches” 1928 Championship was the prize of this valuable donation.